It was a VERY early start today. I had to be up at 4, to be at Craig’s for 430, where we had a taxi waiting to take us to Manchester Airport for an 830 flight. Now I normally hate early starts like this, but the excitement and adrenaline of going on my first proper team training camp abroad soon took over any feelings of tiredness. After a quick flight and even quicker transfer we arrived at Port de Polenca and the brilliant Fergus style Hotel. This Hotel is completely kitted out for cyclists, from wall hanging bike locks to specially built cleaning bays with plumbed in jet washes! Once our bikes were built and we were all ready, the decision was made to do a short ride out to the lighthouse. This was a shorter route than originally planned but today was also Milan San Remo and we all agreed that we’d like to be back in time to catch the last 30/40km. After all we had a ‘BIG’ week ahead of us. The pace when we set off was comfortable, nice and easy relaxing in to it. 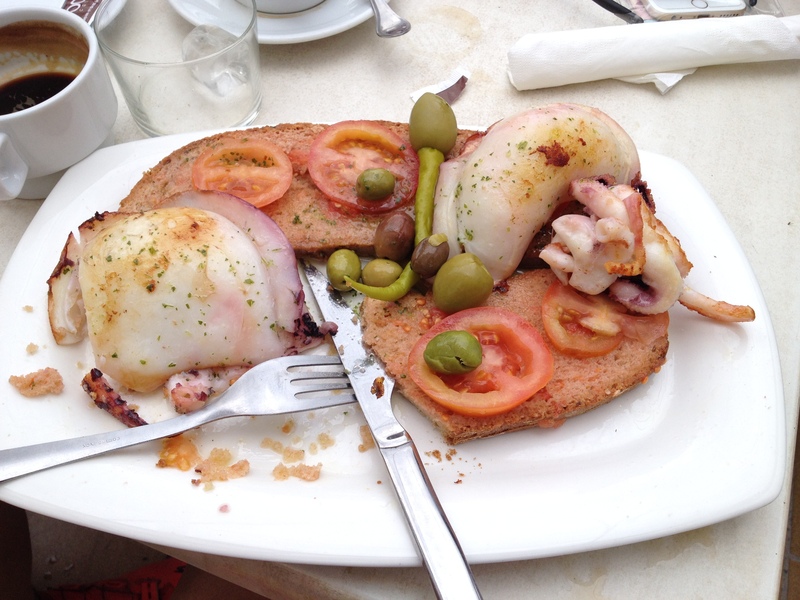 This lasted about 3 minutes until we hit the Formentor climb. As soon as the road started to rise, so did the testosterone levels! Fuelled by the excitement of a week away from our wives, the pace seemed to settle at a steady 420 watts and we ‘cruised’ up and over the crest of the climb. A beautiful technical descent awaited us and we sped down to the café on the other side. A quick brew stop and it was time to get back up what we’d just come down, thankfully this time at a more manageable pace. Another swift descent and of course a “mandatory” puncture for Craig, we were at the famous Tolo’s for a super-greens smoothie (aka beer)! After catching up on sleep lost the night before, we were out and ready to go for 930. That is except for our team teenager Tom (aka ‘Kevin’ from Harry Enfield) who didn’t even manage to surface till 0920! The usual format took place in terms of 5 minute turns on the front before you could put on your best “I found that easy face” and heroically sag back in to the group to recover. This pace was pretty much maintained all the way to the fantastic climb of San Salvador. Standing out like the lonely mountain of Erebor, you can see this sucker coming from miles away but I was feeling good and ready to take it on! We hit the bottom and I was hot on the heels of our best climbers Craig and Ste. They were slowly getting away but I was happy that I was still close, given the two of them together weigh the same as me! Ha! I was still feeling good at about the half-way point but it was getting harder to maintain the pace. Billy and me were working well together when disaster! We’d caught up with a coach that was trying to make its way up the winding climb. Craig and Ste had managed to get past it but Billy and I had got stuck behind. We reached a pinch point in the road and the coach stopped forcing Billy and me to unclip. Once started again the climbing momentum had been destroyed but we accelerated past the coach and put a huge effort to get within touching distance of Craig and Ste. I’d underestimated the length of the climb and the gradient! 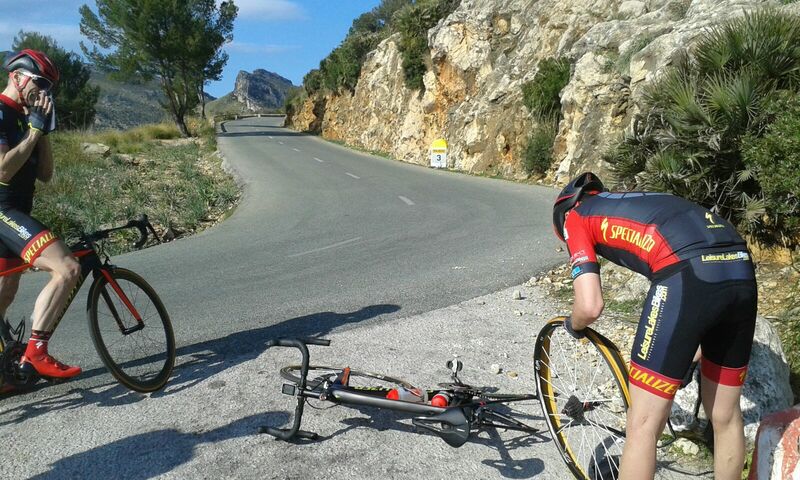 As we moved higher so did the gradient and the sprint past the coach had taken its toll. I lost Billy’s wheel and I started to go backwards. One by one my team mates past me. I could sense there inner laughter as they went by “haha idiot went way to hard too soon!” and I knew it. I got to the top and had just enough time to see the monument at the top before we did a full 180 and rode back down the incredibly technical descent. After a hearty, full squid lunch, we had some fun on the way back with a good bit of through and off until we reached what’s known as The Marshes. Kris attacked! He’d got a good 100m gap when Karl went after him, so I jumped on his wheel. Karl dragged the 2 of us up to Kris were we stayed until Craig, Si and Ste joined us. We then started to work together and we were nailing it! I was feeling ok but it was hard riding and I wasn’t expecting it. It was just like being in a race. Kris was shouting orders motivating everyone to keep going and Craig was letting anyone who missed a turn know that that wasn’t allowed 😉 It was a full blown breakaway race scenario, all the way back to the hotel and the Pollenca sign. What a day! 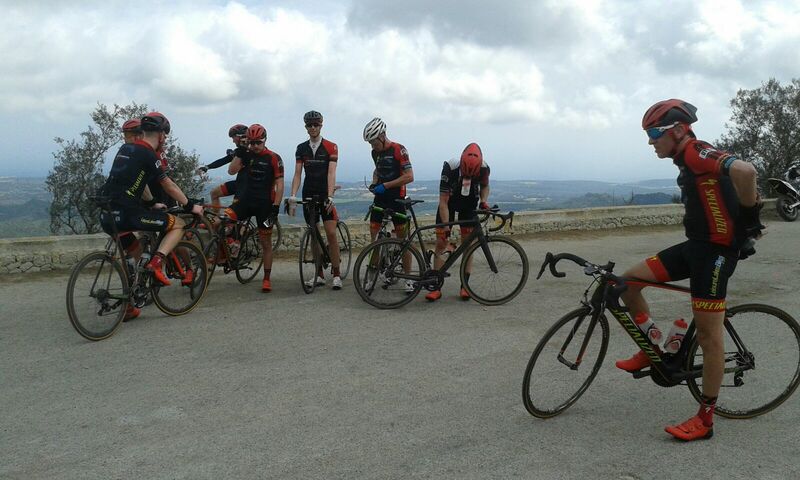 This entry was posted in Results and Reports and tagged Adam Baines, mallorca, training camp. Bookmark the permalink.